The new SOPA bill is yet another attempt to censor the only true medium for freedom of speech and infringe further on the civil liberties of every individual that uses the internet. 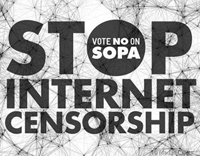 SOPA has no respect for local and national laws in various jurisdictions around the world. Coupled with the one-sided extradition treaties held by the USA with countries such as the UK it could be a serious threat to civil liberties. The example of how the USA is pursuing Gary McKinnon, an aspergers sufferer, who let’s face it made a mockery of the US defence and military computer systems from an old PC in his bedroom in north London. If we were them would be offering him a job not thirty years in jail. Or Richard O’Dwyer now facing extradition for providing a link to a website readily available on Google. While Sealand has never supported the infringement of copyright or the theft of intellectual proprietary rights it is easy to see how such a law could be misused by overzealous enforcers. Governments hate anything they cannot control and this is less an issue of internet piracy and more of an attempt to grasp control over our freedoms of access to free information.